The nominal market in which workers find paying work, employers find willing workers, and wage rates are determined. in the context of the firm , ask the question ” How much benefit is the firm getting when it hires that incremental employee . In return applicants to a new job are selling there skills and experience to convince a hiring firm that the applicant will satisfy that demand. A marginal revenue product (MRP), also known as the marginal value product, is the market value of one additional unit of output. The marginal revenue product is calculated by multiplying the marginal physical product (MPP) by the marginal revenue (MR). The MRP assumes that the expenditures on other factors remain unchanged. Oscar follows up the discourse with a story of a judge who pardons a criminal, “thats power”. to betray the formal code, to see value and future value, more so than a punishment of death to a felon. So how does the government work and how does it keep it self in check? U.S. Federal Government has three branches, two that are influence by democratic vote. at 4 minutes to the end of this sweet and short presentation, an important and historical question is asked. this is described in certain contexts, especially the Judicial as the Liberal – Conservative argument. the so called conservative interpretation, is to stick firmly to the intentions of th constitutional authors. This is a challenge because one would have to understand the complete history in zeigeist of the authors, and do so from todays lenses. The so called liberal perceptive is that the authors of the constitution expected the interpretation of the constitution to change. After All the Constitution is amendable. But how flexible should a reinterpretation of the constitutional be? what is the frame work or precess for the flexibility? what are the consequences for a quick deviation? 2017-2018 more than ever– especially if one is bombarded with news from television, radio and web feeds– over what is happening “over there”. this group and that group, and globalisation. Are the going-ons of “over-there” really more important.. during the entire course of a day.. than, going-ons right in the air one breathes… his wellness? does the ” happening over-there” really apply to oneself? How would he know? his expertise is what and where HE_is over the course of a day. it is not avoidant, excessively selfish or xenophobic, to organize ones influence, affect and maintenance from a localized center zoning of importance. In his work ” Introduction of Permaculture“, Mollison explains his use of “zoning” to allocate areas of gardening and agriculture in a landscape. “Zones”, are prioritize by importance and demand of work. most important and/or work/time intensive crops are located closes to the dwelling area. Un-farmed areas are designated as “the wild”. Mollison’s (and fellow permaculture father Dave Holmgren) application of zoning is, essential, the act of organizing one’s environment — in the case of permaculture — the garden or farm, around and including living-space. 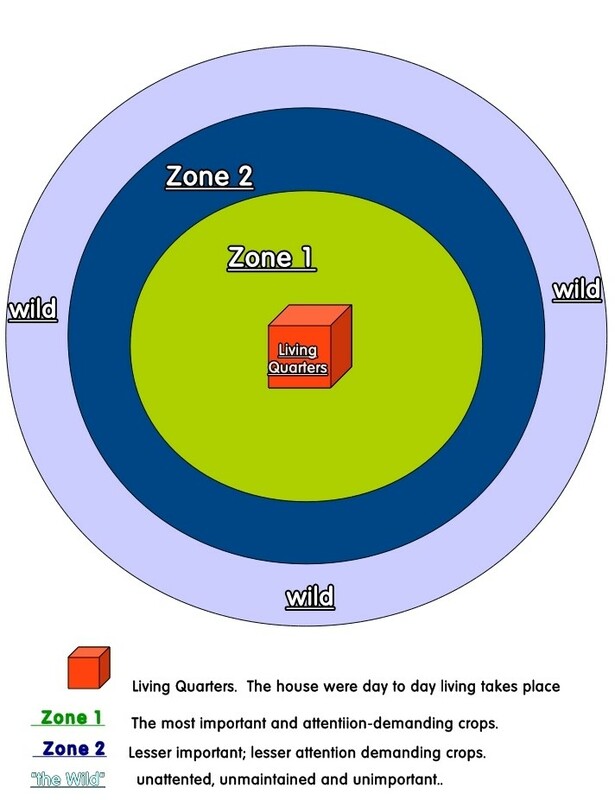 In the image above the living quarters in graphically centered; the most labor intensive and important areas of the garden are kept close .. the least important tasks are pushed to “the wild” or unmanaged land. I’ve been thinking about the Permaculture method of zoning in gardening and agriculture and I have wondered if one could apply (pattern, if you will) zoning to managing the flood of stimuli and information that seems thrown at us in our day-to-day busy lives. So many things we sense or think about in any moment of our consciousness, One could easily feel overwhelmed and overloaded. I am wondering if i can make a connection with Gestalt talk as well, as one visualize zones as figures formed out of a ground (what Mollison calls the wild) by designers. Could one organize, or garden , his rough consciousness landscape of raw stimuli, senses thoughts, worries, brainstorms and activities? 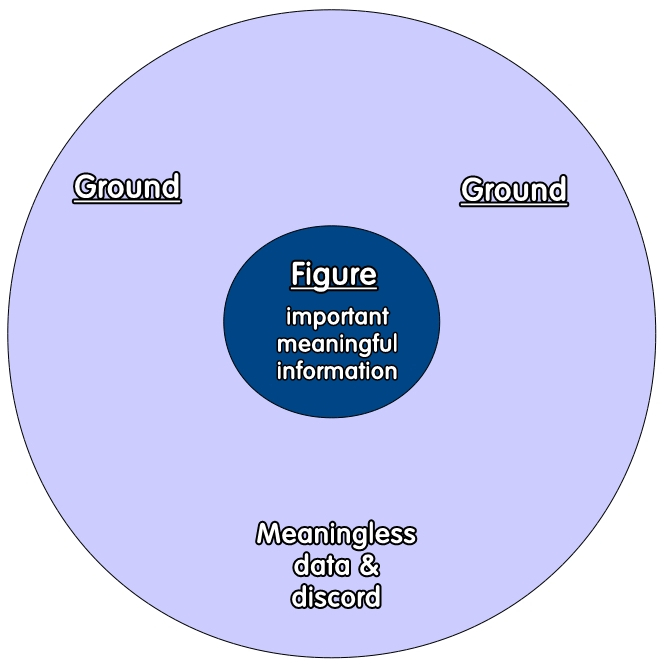 Keep the meaningful tasks, ideas and concerns close and push meaningless data to the background? Image, senses and thoughts arise as Gestalts, figures from the background of constant noise, discord… It’s up to you and I to decide what is meaningful, important at a given moment, and reject unimportant information, zone back to “the wild”, or background. so how can i improve my abilty to “zone” the flood of information each day? here is one: Pennsylavania Echoes — Todo List. I keep a todo or task list on my computer, also a calendar — and I have learned not to worry about them until I look at them again. relax, be confident, be square in posture. I like this breathing exercise and practice often. I am less distracted by unimportant thing in the present- centered moment. 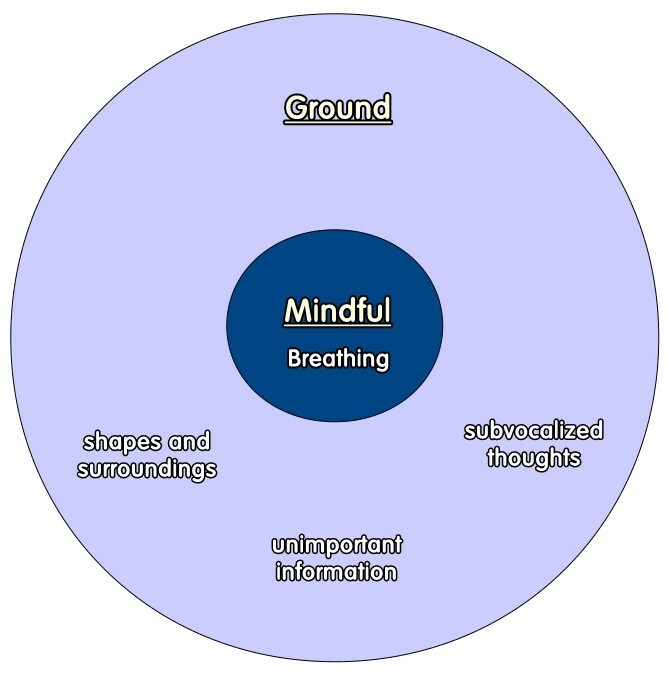 When being mindful of only breathing, breathing fills the whole of mindfulness, a single zone, while all else is ignored and left to the background of wild data. cognation and doing what is important at the moment, and letting go of the unimportant. Its a great way to reducing stress, feeling more organized, focused and at-peace. all you really need is a pencil and paper. To better understand William James’s metaphor of the Cash Value of Truth, I would like to make a case that “Cash value of Meaning” would be an improved word choice for today. This is to say that from a subjective stand point, a person decides what is meaningful and how meaningful in any given context ( family social, work social environmental, aesthetically such as Studying a sculpture in a gallery) etc), in a market like process. Each context has own meanings, finally interpreted by the person, himself in his own interests. A simplified example two people in the context of conversation. Each person brings memory, previous opinion, biology, world view, diction and present mood into the field of conversation. This context of meeting includes the physical location, and participants, including anything in the background. It maybe limited to what was discussed. If the two converse freely, the talking points and their significance of each discussed topic is decided by the participants in a intersubjective manner. All the topics discussed belong to the conversation and should rely only on that field at the time. How significant each topic was is prioritized with events in that field of conversation. This may have been a meaningful exchange. The importances of this bracket event: the conversation, is experienced and prioritized by emotive, intellectual and active reaction. the important moments are provocative. Later, If one the participants, reflects on the conversation earlier (people usually do) to define more meaning, they are now creating a NEW context. Now the context, or field, is with the person and his memory. Probably not as provocative… the entire market place is within the coercion of his own world view and mood of the location and his body/mind. The participants of the market place, of this moment of reflection are entirely himself. All arguments are of himself… body,mind, location. Each meaningful experience is localized event. This fits with James thoughts that life is a series of interwoven experiences. Interpersonal / intersubjective meanings are less coerced when it is discussed or experienced with multiple participants, whether other people, organisms, or environmental agents. just as William James market- like metaphor suggest. The building blocks of are more constant meaningful ideas are defined tested and retested by new day to day experiences. “Truth’s” for William James, are meaningful (in that they provocative or conscious constructed) ideas that are assimilated by one or many by verification in the marketplace of a reality. Truth is always contextual, always referring to experience, social, environmental, spatial, etc. Truth always refers to an experience or a series of experiences where they are verified intersubjectively by all the participants in the field. This holds true in science and other Academic contexts where ideas are rigorously tested by the tester, subject and controlled fields of testing. “Truth Happens to an Idea“ as James proclaims, after rigorous testing in experiences, or its deemed as not true. “Meaning of Ideas” is when those ideas and happenings, true or not, have a significance or use, and a how significant or useful to the ideas that are tested in the realm of experiences.